Pure Surface Disinfectant is your only choice for a proven hard surface antimicrobial disinfectant and deodorizer that offers rapid efficacy. Pure Surface Disinfectant kills the most deadly of superbugs, yet also kills everyday household germs. The 24 Hour Solution Pure Surface Disinfectant is an EPA registered, broad spectrum antimicrobial disinfectant and deodorizer with unique 24 hour residual effectiveness. Pure Surface Disinfectant has an EPA IV toxicity rating; the lowest rating assigned by the Federal EPA. Pure Surface Disinfectant is non-flammable, non-corrosive, and odorless without the fumes or skin irritation associated with traditional disinfectants. Pure Surface Disinfectant is strong enough to kill the most dangerous viruses (Norovirus) and bacteria (MRSA) in a hospital environment, yet EPA registered for use on children’s toys at home. Eliminate odors and disinfects in one-step. Remove odors without the use of Toxic Chemicals. Pure Surface Disinfectant works by killing the bacteria that causes the odors, not just covering them up. Use for Pet Odors including urine, gym bags, sports gear and shoes, lockers, carpets, diaper pails, laundry baskets, sewer spills, autos & RV's, and marine use too. 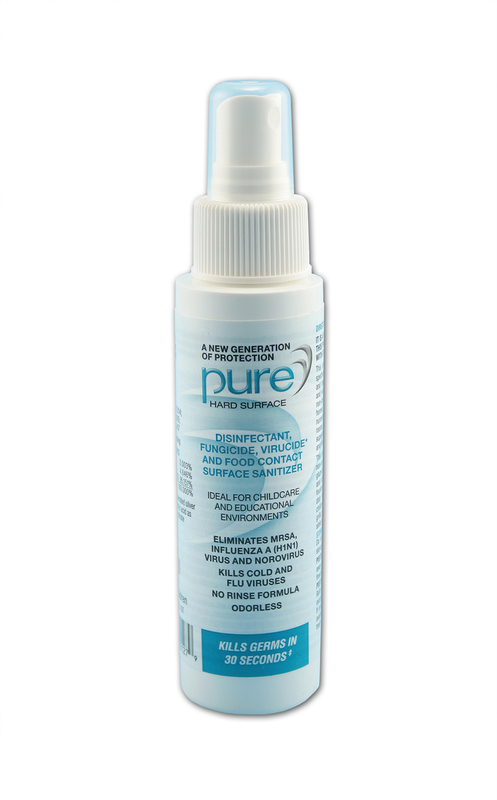 Pure Surface Disinfectant will get rid of the odors without damaging fabrics or carpet.